Make and serve yummy drinks! A witch of debatable evilness has punished you for your callous attitude towards the barrista class. 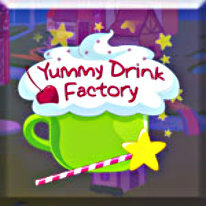 Now you must enter the Yummy Drink Factory and serve delicious drinks to thirsty villagers as you work your way to freedom. Unlock tasty new recipes and purchase shop decorations to keep your patrons happy. Can you earn enough to satisfy the witch and earn your liberty? And will you even want to leave the yummy drink factory once you're freed?